A Simply Chocolate exclusive! Famed Knipschildt Chocolatier has created an opulent textured gold gift box of premium chocolates that will wow even the most ardent chocophile. Their renowned Dark Chocolate Ganache Bonbons pair well with the amazing Chocopologie Fair Trade Certified Dark Chocolate Raspberry Ganache Truffles. 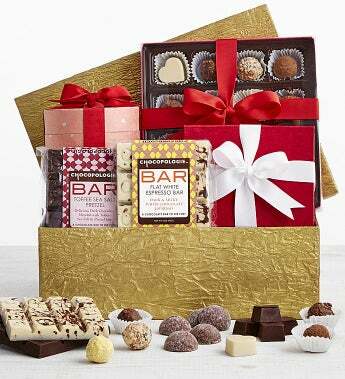 They've added in even more decadence with the intriguing flavors of their 16pc Chocopologie Assorted Truffles box and two Chocopologie Artisan Bars. This beautiful gift is carefully packed and tied with a red grosgrain ribbon. A generously sized, quarter pound dark & milky white chocolate bar "to die for"